Niagara Falls, NY - Niagara Falls Memorial Medical CEO Joseph Ruffolo was pleased to accept $400k for hospital improvements from Senator Rob Ort. Please see the press release below following today's announcement. State Senator Rob Ortt (R,C,I – North Tonawanda) today announced he secured a total of $1 million for infrastructure projects at three local hospitals that will serve as a catalyst for economic growth and job creation. The funding, secured by Senator Ortt as part of the 2017-18 state budget, supports projects at Niagara Falls Memorial Medical Center, DeGraff Memorial Hospital in North Tonawanda, and Mount St. Mary’s Hospital in Lewiston. 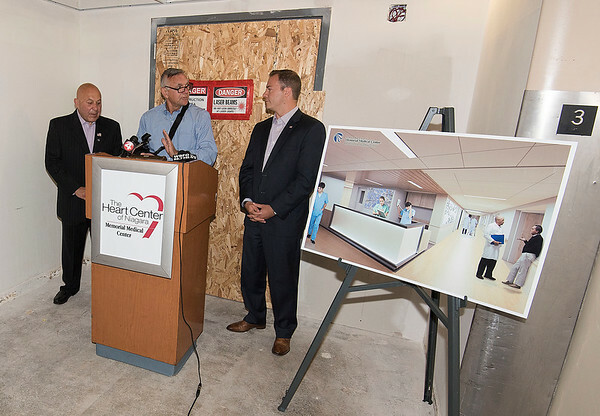 Niagara Falls Memorial Medical Center was awarded $400,000 for its new inpatient Cardiac and Stroke Center. The 12,950-square-foot facility will replace the hospital’s 40-year-old telemetry unit. The center will feature 25 private rooms equipped with state-of-the-art technology. The $4.3 million project will include a family and patient resource room and medical teaching facilities. The project will also feature a new inpatient rehabilitation center that will make it more convenient to begin physical therapy and occupational therapy while still in the hospital, thus contributing to more positive long-term patient outcomes. Since the start of construction in October 2016, the project has created 15 construction jobs. The new facility is scheduled to open this November. DeGraff Memorial Hospital will use a $300,000 grant for a portion of the cost of renovation and expansion to transform its Emergency Department. In order to accommodate the growing patient needs that resulted in 12,505 emergency visits in 2015, DeGraff needed to expand its ER. The department will move to the hospital’s east side, and the new space will more than double the existing square footage. The new 10,264-square-foot facility will include 17 treatment bays with high-tech equipment and energy efficiencies, trauma, bariatric and airborne isolation rooms, as well as a decontamination area for infectious threats. An additional 3,075-square-foot-space will include a new main lobby and patient registration area. The building’s exterior will have a modern, updated façade with improved signage to facilitate traffic flow. As a result of the $7.8 million project, DeGraff will create approximately 125 construction jobs. The new Emergency Department is expected to open in 2018. Mount St. Mary’s Hospital will use a grant of $300,000 to upgrade its electrical distribution system in the main building that was originally constructed in 1965. Replacing the antiquated system will improve safeguards on the campus and better protect both patients and visitors. Upgrades include new transformers, main breakers, a generator housing structure, and seven new transfer switches with monitoring systems. An estimate of 30 construction jobs over the next several months will be created for this project. The funds are being administered by the Dormitory Authority of the State of New York (DASNY).